As a Plaidneck, I mess around in offbeat Highland stuff. One question that comes to mind is “Is there a Saint connected with the Highlands”. 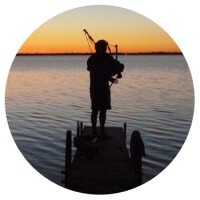 I am a very amateur piper and if there is a truly Highland Saint, what pipe tunes would suit. A while ago, someone suggested St. Maelrubha (Mellroova ??) as a suitable individual. Maelrubha was an early Christian working in the Highlands. He founded his settlement in what is now Applecross (Aber Crossan or Aporcrossan). The peninsula where Applecross sits was known by its Gaelic name, ‘A’ Chomraich’ (or Comaraich), “the sanctuary”. His ministry also extended into the inner Hebrides. St. Maelrubha’s Day has been set as August 27th. In my part of the world, late August is a great time for piping. The dog days of summer are past, flies and mosquitos are long gone but it hasn’t yet started to get cold. So, a Highland Saint whose day falls at a time of year with decent piping weather (at least here). What’s not to like? Are there any suitable tunes? Apparently the Great Highland Bagpipe came into being in the 1700s. Although there have been bagpipes since ancient times, the one most known it a fairly recent development. At first it was a solo instrument playing a theme and variation type of music we now call Piobearachd (Pibrock comes close to how that is pronounced) and dance music. Pipe bands came into being in the mid 1800s with the English army. Civilian bands are from the 1900s. The piping most of us hear is heavily influenced by (British) army band playing and the demands of competition shaped by lowland organizations. There is a movement to revive a dance driven style among some solo pipers – but I digress. So what tunes to play on St. Maelrubha’s Day. There probably isn’t original pipe music from that time. However, there are some tunes associated with the area he chose to make his mission. I’ve done a very quick search and found a few “Applecross” tunes. Three were written by a D. McNair (“Applecross Hills”; “Mrs Platt’s Farewell to Applecross” – both listed as quicksteps; “the Applecross Highlanders” – a march) plus a “Dr. Ronald MacLean of Applecross” (probably a march) by Neil A MacDonald. There is a piobearachd (“Failte Tighearna na Comaraich) by Angus Mackay and a geographic connection between Maelrubha and “Loch Maree” (a 3/4 march). Shouldn’t we be more concerned? » « Why the Loon? A small “c” conservative especially of “highlander” descent.